Freddy Fazbear’s Pizzeria Simulator (FNAF 6) is a pizzeria tycoon game that involves surviving the night by fending off attacks from creepy animatronics. It’s still a Five Nights at Freddy’s game at its core, so survival depends on using the right strategy. This guide offers several tips for surviving each night in Freddy Fazbear’s Pizzeria Simulator for those who are struggling or who do not want to deal with jump scares. If you are able to survive each night and complete your pizzeria tasks for the week, you will have completed the game with one of FNAF 6’s multiple endings. If there’s an ending certificate you’re missing, head to our guide on how to unlock all endings in Freddy Fazbear’s Pizzeria Simulator for details. 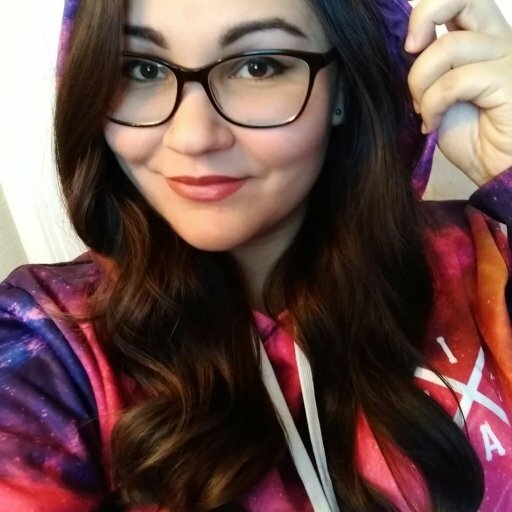 Do Not Buy Lefty - Regardless of the price or liability rating, you should avoid purchasing Lefty at all costs if you want to ensure you survive the night in FNAF 6. 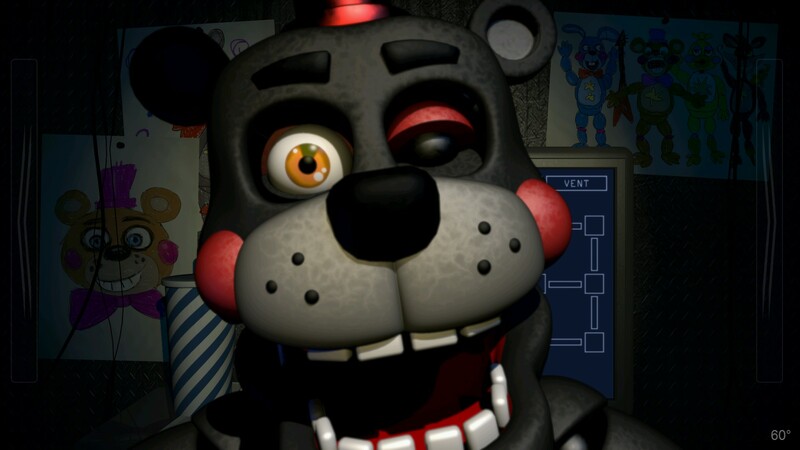 Lefty seems to greatly increase your chances of getting attacked in Freddy Fazbear’s Pizzeria Simulator, so it’s best to simply avoid buying Lefty at all. Keep the Fan Off - In Freddy Fazbear’s Pizzeria Simulator, the animatronics are attracted to various noises. This is why you’ll want to keep your fan off for as long as possible, since the fan noise can lure an unwanted guest. Watch the temperature in the lower right corner and turn on the fan only if it gets too hot. If you must turn on the fan, do so while you have a task running to drown out the noise. Avoid Sponsorships - If you accept a sponsorship deal, loud advertisements will play on your computer screen, running the risk of attracting an animatronic toward you. Although ads can help you earn more cash, it may not be worth the risk if you want to ensure your survival in FNAF 6. Buy Upgrades - Upgrading your computer and printer will allow them to complete activities faster. The sooner a task is finished, the less noise it makes, which will improve your chances of surviving the night. In Freddy Fazbear’s Pizzeria Simulator (FNAF 6), one of the most stressful parts of the game is trying to complete your pizzeria tasks during the night without getting attacked or jump-scared by one of the animatronics. Here are a few tips and strategies you can use to defend against animatronics and survive each night in Freddy Fazbear’s Pizzeria Simulator. One way to defend against animatronics while completing pizzeria tasks at night is to essentially stay one step ahead of them. You have various tools at your disposal on your work computer that you can use to distract animatronics and monitor their movements during the night. However, keep in mind that activating one thing can counteract the effects of another, so you’ll have to find a way to strike a balance. Start by selecting the Motion Detector tab on the display and activating the motion scanner to see where an animatronic might be in the vents. Once an animatronic has been detected in one of the rooms, switch over to the Audio tab and select the adjacent room farthest from your office to distract it with music and lure it away from you. 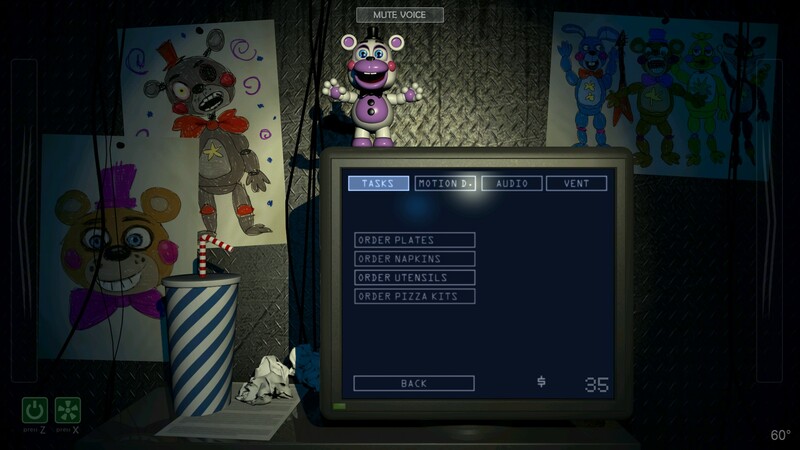 If more than one animatronic is detected, play the audio on the side where most of them have accumulated and just keep watching the opposite air vent to avoid being surprised from the other side. While the audio is on, switch back and complete the next task on your list. Tasks can be noisy too, but if you distract the creatures enough with other audio, you may delay them from hunting you down directly. Repeatedly check the air vents and listen for any odd sounds. If you hear an animatronic get too close, power down everything and wait for it to go away. Once you feel the coast is clear, continue this process until all tasks are complete and you can log off. Another way to avoid being ambushed by an animatronic throughout the night is to simply prevent them from entering the pizzeria at all. 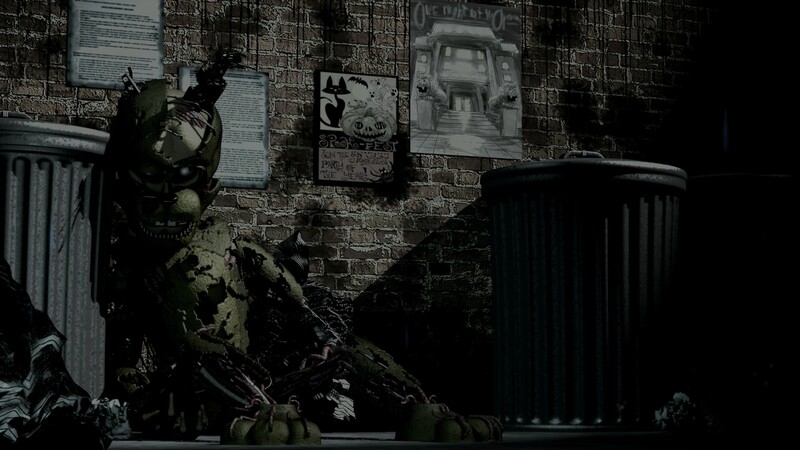 For a better chance at survival, you can choose to throw out every animatronic instead of salvaging them, which prevents them from attacking you in the pizzeria. However, this tactic not only bars you from earning more money from salvages, but it also prevents you from achieving the good ending in FNAF 6. Additionally, you should avoid purchasing items that are marked down. These items run the risk of having an animatronic hidden inside them, trying to Trojan-horse their way into your pizzeria. If you want to go for a no jump-scare run in Freddy Fazbear’s Pizzeria Simulator, then this preventative tactic is your best bet for defending against animatronics in FNAF 6. There you have it. If you follow the tips in this guide, you should be able to survive each night in Freddy Fazbear’s Pizzeria Simulator. In between shifts, make sure you know how to complete all the lore mini-games in FNAF 6 as well to ensure you earn the Lorekeeper certificate.